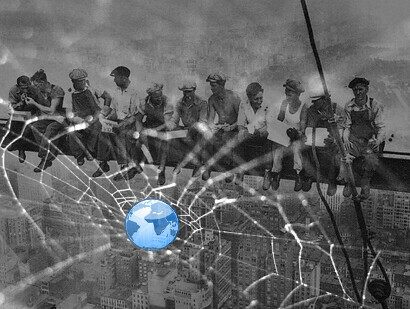 Web Workers for which scenarios? 2 – There were some other ways to more or less solve this concurrency problem. Those ways are well known from all web developers. We were indeed trying to simulate parallel tasks thanks to the setTimeout() and setInterval() methods for instance. HTTP requests can also be done in asynchronous manner thanks to the XMLHttpRequest object which avoids freezing the UI while loading some resources from some remote servers. At last, the DOM Events allow us to write application making the illusion that several things occurs at the same time. Illusion, really? Yes! – from 0 to 5ms: the init() function starts by a 5ms task. After 5ms, the user raises a mouse click event. However, this event can’t be handled right now as we’re still executing the init() function which currently monopolize the main thread. The click event is saved and will be handled later on. – from 5 to 10ms: the init() function continues its processing during 5ms and then asks to schedule the call to the timerTask() in 10ms. This function should then logically be executed at the 20ms timeframe. – from 10 to 15ms: 5 new milliseconds are needed to finish the complete run of the init() function. This is then corresponding to the 15ms yellow block. As we’re freeing the main thread, it can now start to dequeue the saved requests. – from 15 to 23ms: the browser starts by running the handleMouseClock() event which runs during 8ms (the blue block). – from 23 to 25 ms: as a side effect, the timerTask() function which was scheduled to be run on the 20ms timeframe is slightly shifted of 3ms. The other scheduled frames (30ms, 40ms, etc.) are respected as there is no more code taking some CPU. In conclusion, all these tips don’t really solve our initial problem: everything keeps being executed inside the main UI thread. The result will the be: “Hello David from a separate thread!”. You’re now impressed, aren’t you? 1 – from the main calling page by calling the terminate() command. 2 – from the worker itself via the close() command. Of course, most of the time we will send some more structurated data to the workers. By the way, Web Workers can also communicate between each others using Message channels. But the only way to send some structurated messages to a worker is to use the JSON format. 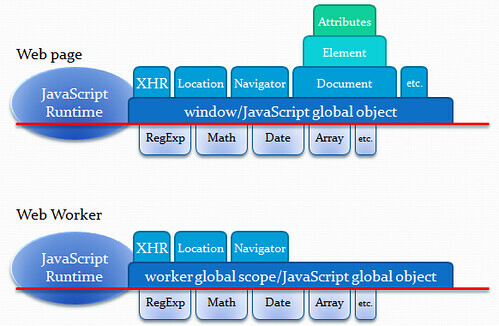 Hopefully, browsers that currently support Web Workers are nice enough to also natively support JSON. How kind they are! Let’s then take our previous code sample. We’re going to add an object of type WorkerMessage. This type will be used to send some commands with parameters to our Web Workers. // which will stop the worker. It won't be usable anymore after that. Once again, this sample is very basic. Still, it should help you to understand the underlying logic. For instance, nothing prevents you to use the same approach to send to a worker some gaming elements that will be handled by an AI or physics engine. In order to dynamically know in your code that this feature is supported, please use the a feature detection mechanism. You shouldn’t use anymore some user-agent sniffing! But the short version is: you don’t have access to the DOM. For instance, as you don’t have access to the window object from a worker, you won’t be able to access to the Local Storage (which any way doesn’t seem to be thread-safe). Those limitations may look too constraint for developers used to multithreaded operations in other environments. However, the big advantage is not to fall into the same problems we usually encounter: lock, races conditions, etc. We won’t have to think about that with web workers. This then makes the web workers something very accessible while allowing some interesting performance boosts in specific scenarios. This is the best Web Workers can give you natively to help you debugging their code… This is very limited, isn’t it? 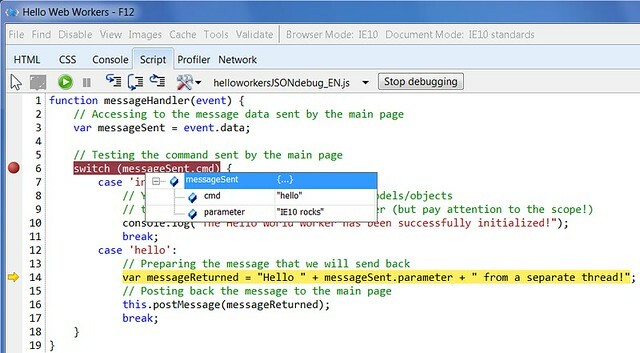 To go beyond that, IE10 offers you to directly debug the code of your Web Workers inside its script debugger like any other script. At last, you need to know that the console object is not available within a worker. Thus, if you need to trace what’s going on inside the worker via the .log() method, it won’t work as the console object won’t be defined. Hopefully, I’ve found an interesting sample that mimic the console.log() behavior by using the MessageChannel: console.log() for Web Workers. This works well inside IE10, Chrome & Opera but not in Firefox as it doesn’t support the MessageChannel yet. – image processing by using the data extracted from the <canvas> or the <video> elements. You can divide the image into several zones and push them to the different workers that will work in parallel. You’ll then benefit from the new generation of multi-cores CPUs. The more you have, the fastest you’ll go. – big amount of data retrieved that you need to parse after an XMLHTTPRequest call. If the time needed to process this data is important, you’d better do it in background inside a web worker to avoid freezing the UI Thread. You’ll then keep a reactive application. – concurrent requests against a local database. IndexDB will allow what the Local Storage can’t offer us: a thread-safe storage environment for our Web Workers. Moreover, if you switch to the video game world, you can think about pushing the AI or physics engines to the Web Workers. For instance, I’ve found this experimentation: On Web Workers, GWT, and a New Physics Demo which use the Box2D physic engine with workers. For your Artificial Intelligence engine, this means also that you will be able in the same timeframe to process more data (anticipate more moves in a chess game for instance). Some of my colleagues may now argue that the only limit is your imagination! 3 – The dependency of the code blocks between them as you may then need some synchronization logic. Parallelization is not something easy my friends! This demo displays some particles effects (the fountains) and uses 1 web worker per fountain to try to compute the particles in the fastest way possible. Each worker result is then aggregated to be displayed inside the <canvas> element. Web Workers can also exchange messages between them via the Message Channels. In this demo, this is used to ask to each of the workers when to change the color of the fountains. We’re then looping through this array of colors: red, orange, yellow, green, blue, purple and pink thanks to the Message Channels. If you’re interesting into the details, jump into the LightManager() function of the Demo3.js file. Feel free also to launch this demo inside Internet Explorer 10, it’s funny to play with! 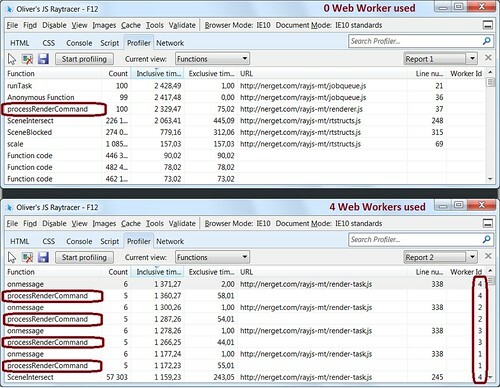 To track the bottlenecks and identity which parts of your code you could send to the web workers, you can use the script profiler available with the F12 bar of IE9/10. It will then help you to identify your hot spots. However, identifying a hot spot doesn’t mean you’ve identified a good candidate for web workers. To better understand that, let’s review together 2 different interesting cases. 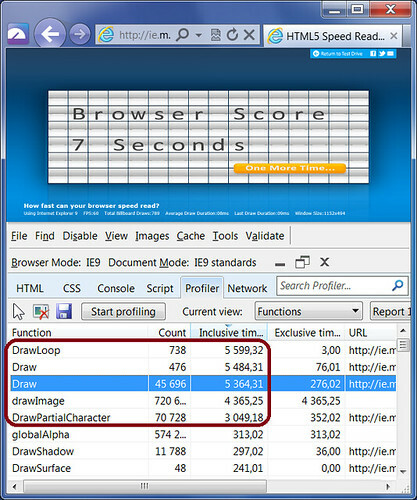 This demo comes from our IE Test Drive center and can be browsed directly here: Speed Reading. It tries to display as fast as possible some characters using the <canvas> element. The goal is to stress the quality of the implementation of the hardware acceleration layer of your browser. But going beyond that, would it be possible to obtain more performance by splitting some operations on threads? We need to achieve some analysis to check that. Where the surface object is referencing a <canvas> element. A quick conclusion of this brief analysis is that this demo spends most of its time drawing inside the Canvas through the drawImage() method. As the <canvas> element is not accessible from a web worker, we won’t be able to offload this time consuming task to different threads (we could have imagined some ways of handling the <canvas> element in a concurrency manner for instance). This demo is then not a good candidate for the parallelization possibilities offered by the web workers. But it’s well illustrating the process you need to put in place. If, after some profiling job, you’re discovering that the major part of the time consuming scripts are deeply linked to DOM objects, the web workers won’t be able to help you boosting the performance of your web app. Let’s now take another easy example to understand. Let’s take a raytracer like this one: Flog.RayTracer Canvas Demo. 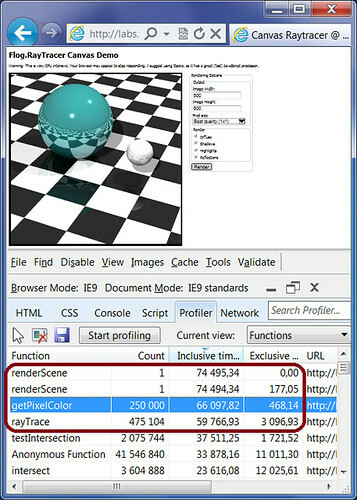 A raytracer uses some very CPU intensive mathematical computations in order to simulate the path of light. The idea is to simulate some effects like reflection, refraction, materials, etc. Again, if we sort the functions in a decreasing order, 2 functions clearly seem to take most of the time: renderScene() and getPixelColor(). In the first screenshot, the processRenderCommand() method is using almost all of the CPU available and the scene is rendered in 2.854s. With 4 web workers, the processRenderCommand() method is executed in parallel on 4 different threads. We can even see their Worker Id on the right column. The scene is rendered this time in 1.473s. The benefits were real: the scene has been rendered 2 times faster. PS : All the samples of this article are available in this ZIP file: https://david.blob.core.windows.net/html5/WebWorkersSamples.zip . Great summary, but the Fountains demo actually performs far worse in Chrome and Safari with the Web Workers option selected. Thoughts? Computers are suppost to get easier to use and therefore Programmming should also get easier. Unless users want to go back to switching binary switches, or carrying punch card that is. Good to see this article. Multi-core systems are ubiquitous these days and sadly, programmers are still writing sequentially. Although the difficulty of programming does increase with the use of threads, the efficiency is evident in practice. Thanks for the article! Web Workers are Great! Nice Write Up!